The topic of ‘watermarks’ is quite a broad and detailed one. This particular article was generated from the finding of a stitch watermark on an otherwise normal Scott #65 owned by Carl and spotted by Jacques, members of the Stamporama Stamp Club. It is not the intention of this article to cover watermarks in general, just "stitch" watermarks in particular. Scotts Cat. : Stitch — The unintentional watermark that is created by the joining of the endless wire mesh belt used in machine-made papermaking. Stitch watermarks, which usually appear as a row of short parallel lines, are caused by the stitching together of the ends of cloth aprons on which the pulp is assembled in the paper making process. Stitch watermarks are usually very faint and are often lost in paper finishing operations. How did Jacques spot the stitch water? 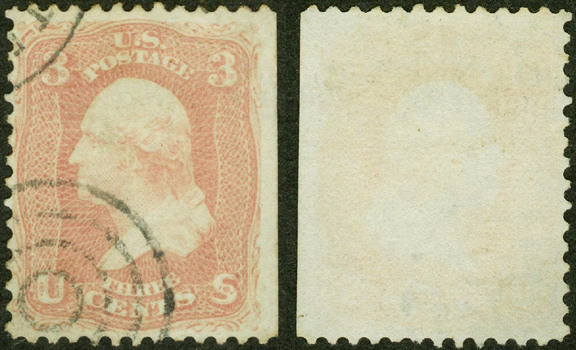 Carl thought that his USA #65 had a faint full stamp grill and submitted it to the Stamporama discussion board for validation. It was submitted in the discussion section but the detail provided still lacked positive proof that the stamp did or did not have a grill. It was suggested that Carl send it to Perry so that higher resolution images could be posted for the membership since Carl did not have the capability of making highly detailed scans. He sent a copy to Perry for further magnification. 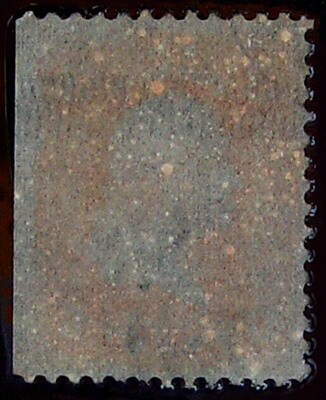 Perry also photographed the backside of the stamp in watermark solution in order to enhance any possibility it had a grill. Jacques, with his eagle eyes, spotted what he believed to be a "stitch" watermark. It was at this point Dan stepped in with the idea of letting the membership know what little information that is available on the subject. What is known: it is possible that ANY stamp could have a stitch watermark printed on rag paper and the value of the stamp(s) involved is greatly increased. In our case Carl has a beautiful #65 which should be a great asset to his collection. Our thanks go out to Jacques, Carl and Perry for bringing it to our attention. Wove paper is a writing paper with a uniform surface, not ribbed or watermarked. The papermaking mould's wires run parallel to each other to produce laid paper, but they are woven together into a fine wire mesh for wove paper. The originator of this new papermaking technique was James Whatman (1702-59) from Kent, England. For 500 years European paper makers could only produce what came to be called laid paper. In 1757 John Baskerville printed his famous edition of Virgil on a new kind of paper, called Wove (known in Europe as Vélin). This paper is now known to have been made by the elder James Whatman. Twenty-five years later (1780's) the manufacture of wove paper spread quickly to other paper mills in England, and was also being developed in France and America. All this took place over a decade before a machine to replace making paper by hand was conceived. With the establishment of the paper machine (1807), the manufacture of paper on a wove wire base never looked back. Today more than 99% of the world's paper is made in this way. Here is a link to the story of paper, which albeit a little long, is very fascinating. Thanks to the efforts of Carl, Jacques, Perry, and Ralph this subject has been made available to our membership.